Ours is an anti-polity age, perhaps more than any other time in the history of the church. Yet polity remains as important now as it was in the New Testament. What then is a right or biblical polity? 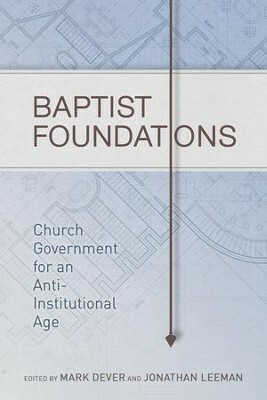 The contributors to this volume make an exegetical and theological case for a Baptist polity. Right polity, they argue, is congregationalism, elder leadership, diaconal service, regenerate church membership, church discipline, and a Baptist approach to the ordinances. 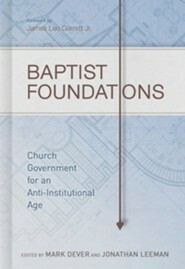 To be read sequentially or used as a reference guide, Baptist Foundations provides a contemporary treatment of Baptist church government and structures, the first of its kind in decades. John S. Hammett (Ph.D., The Southern Baptist Theological Seminary) is professor of Systematic Theology at Southeastern Baptist Theological Seminary in Wake Forest, North Carolina. Benjamin L. Merkle (Ph.D., The Southern Baptist Theological Seminary) is associate professor of New Testament and Greek at Southeastern Baptist Theological Seminary. Thomas R. Schreiner is the James Harrison Professor of New Testament Interpretation at The Southern Baptist Theological Seminary in Louisville, Kentucky. He has also taught New Testament at Azusa Pacific University and Bethel Theological Seminary. He received a B.S. from Western Oregon University, a M.Div. and Th.M. from Western Conservative Baptist Seminary, and a Ph.D. in New Testament from Fuller Theological Seminary. He has published a number of articles and book reviews in scholarly journals. His published books include: Interpreting the Pauline Epistles, The Law and Its Fulfillment: A Pauline Theology of Law; Romans; Women in the Church: A Fresh Analysis of 1 Timothy 2:9-15, co-edited with H. S. Baldwin and A. Kostenberger; Still Sovereign: Contemporary Perspectives on Election, Foreknowledge, and Grace, co-edited with B. A. Ware; The Race Set Before Us: A Biblical Theology of Perseverance and Assurance, co-authored with Ardel Caneday, Paul, Apostle of God's Glory in Christ: A Pauline Theology; New Testament Theology: Magnifying God in Christ. He is also the preaching pastor of Clifton Baptist Church in Louisville, Kentucky. He is married to Diane Elaine and they have four children: Daniel, Patrick, John, and Anna. 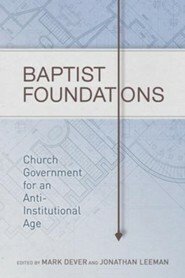 I'm the author/artist and I want to review Baptist Foundations: Church Government for an Anti-Institutional Age - eBook.